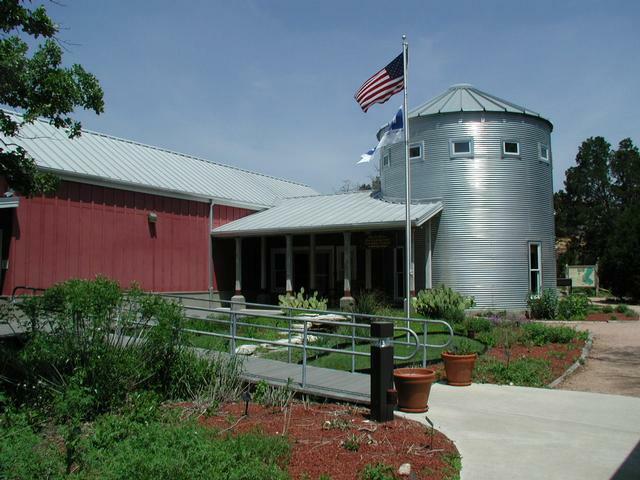 McKinney Roughs includes an extensive learning center and hosts many school groups to teach children about the environment. 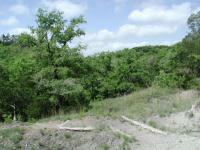 Getting there: McKinney Roughs is located right on Hwy. 71 between Austin and Bastrop. From Austin, head east on Hwy. 71 past Austin Bergstom International Airport. Proceed for about 10-15 miles and look for the park's distinctive rock wall entrance with windmill on the left. Hiker check in is at the LCRA Office near the main parking area. 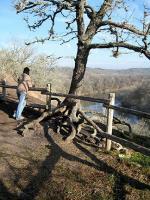 The Hike: McKinney Roughs contains the most extensive collection of hiking trails to be found in Central Texas. The official park website mentions over 15 miles of trails, with more planned in the future. All trails start at the waypoint marked "Trailhead" on the map. The exceptions to this are the two Equestrian trailheads that lie near the northwest and southeast corners of the park (not yet mapped). This main hiking trailhead is behind the red Environmental Learning Center building. The easiest trail in the park, the Ridge Trail is shown on the topo map in blue to make it easy to find. The trail is mostly flat with a smooth surface of crushed granite. Someone was in the process of creating an interpretive trail guide for this path during my last visit and I was able to borrow an advance copy to take along. Unlike many interpretive guides, this one went into some interesting details about the coexistence and synergy between many of the species and plants and animals that call McKinney Roughs home. 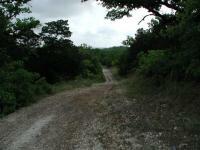 The trails of McKinney Roughs undulate up and down hillsides. The remaining trails are a criss-crossed collection of full and partial loops that provide ways to craft almost any type of hike you could want. 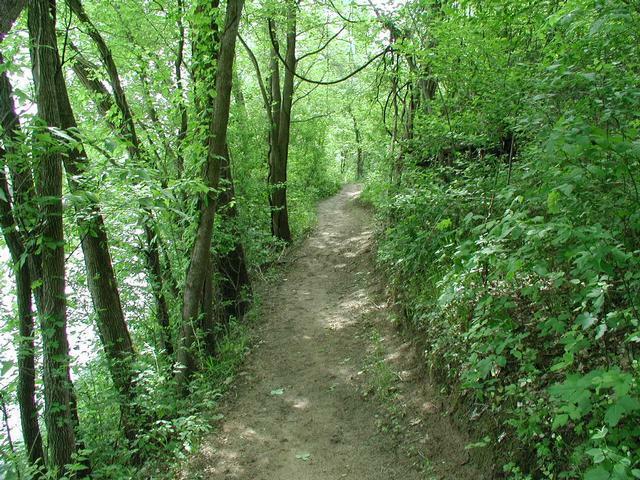 The trail surfaces consist of rocky hardpack in the uplands and dirt and occasionally sand along the river's edge. 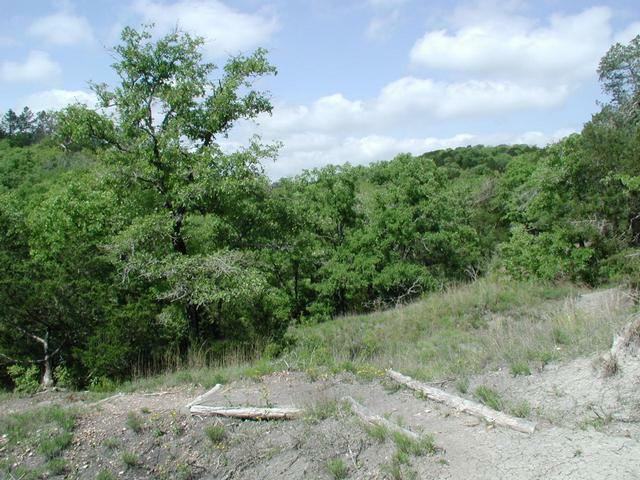 Most of the tree cover at McKinney Roughs consists of the Juniper-Oak combination that is commonly found throughout the hillcountry to the west. 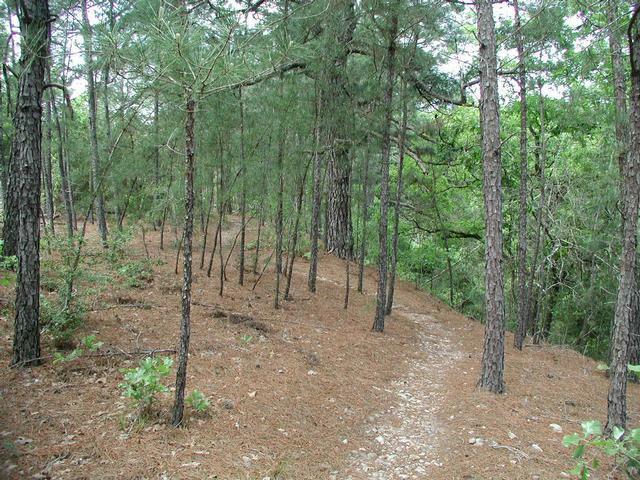 But this land is on the very outer edges of the Lost Pines area and some stands of pine can be found, particularly on the east side of the park. Flat portions of the trails are often marked by pocket prairies. These spots of open land are a treasure trove of wildflowers. One of the better areas for wildflowers of all varieties was the pocket prairie along the Bobcat Ridge trail just west of the main entrance driveway. 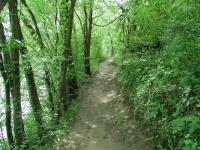 As trails descend to the river the surrounding vegetation closes in on it. The path narrows considerably and the wildflowers disappear. Instead the ground is covered in a thick carpeting of various grasses, all very green. The Colorado River as seen from the trail. 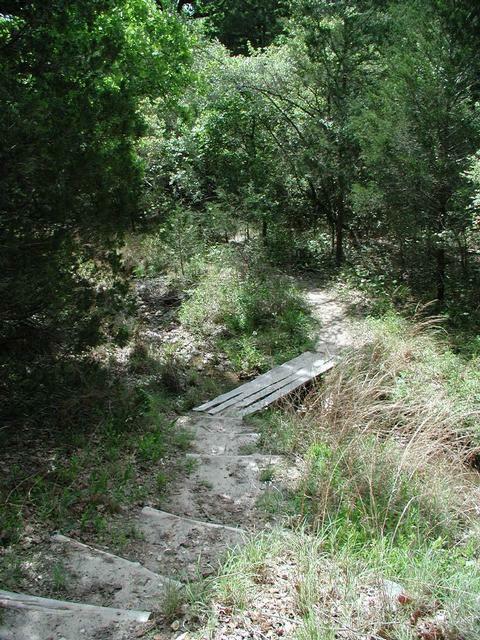 Most of the trails at McKinney Roughs allow for horseback riding. If being near an occasional horse is intimidating you can avoid them altogether by limiting your hike to the Ridge, Woodland, Cypress, Pine Ridge, Valley View and Bluff Loop trails. These total over 5 miles, approximately one third of the park's total trail system. Don't be afraid of the horses and let a majority of the park go unhiked! When coming up on a horse and rider, stand on the side of the trail motionless and gently chat with the riders as they pass by. As has always been my experience at McKinney Roughs, the riders are friendly and considerate. 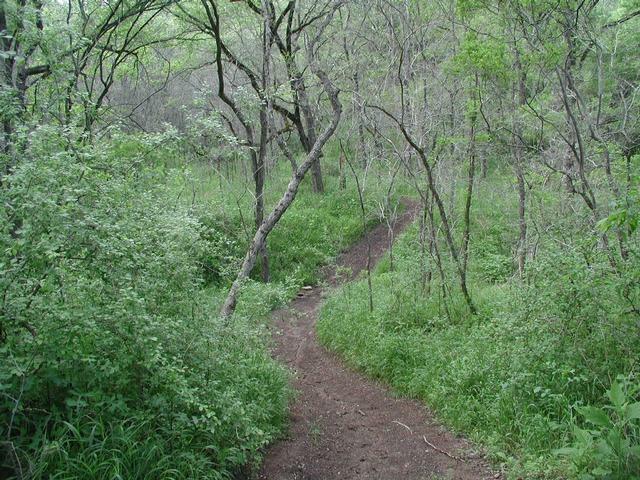 Some portions of the paths are old jeep trails. The trails on some of my visits had an unfortunate trait that I had not anticipated - cobwebs. Lots of them. Spiders find that by spanning a sticky web across a open area like a trail they can capture more frequent meals. What it meant for me was a frequent brushing of my arms and legs to free myself from the web's snare. Eventually I adopted a long branch, which when waved in front of my direction like a royal sceptor cut down on the number of web collisions. But sometimes the method served only to break the silky stand, which willowed in the wind and stuck to the first available object, often my clothes or skin. Added to the spider webs were catepillar strands. Hanging under oaks like bungee jumpers the little green guys contributed to making the going slow as I tried my best to clear a path. I'm sure that fellow hikers who followed my path later in the day reported far fewer web encounters. Don't let this tidbit scare you. Spring is bound to include more activity with respect to spider webs and caterpillar strands. Hiking at different times of the year may avoid this hassle. 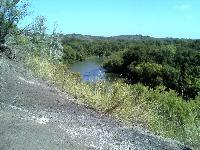 A wonderful view of the Colorado River is available at the waypoint "Overlook". The view shows some of the contrasts in the land here. 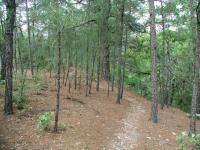 To the right of the river the hilly terrain continues and is heavily forested. On the opposite bank the land is relatively flat and since it is more conducive to being farmed it has been cleared. 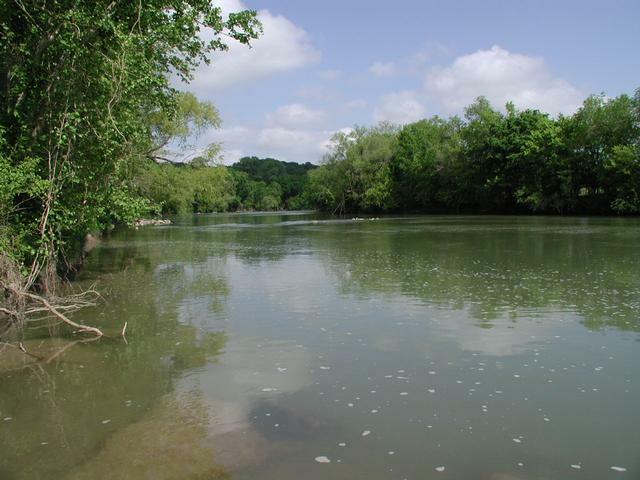 Although McKinney Roughs bears the name of Thomas McKinney, there is no proof that he either lived there nor owned any of the land. However, he did own a lumber mill across the river and may have used some of the trees cut down within the boundaries of the current park. Though somewhat saddened by the sale of the northern half of the park, McKinney Roughs remains a prime hiking destination in the central Texas area. The complex system of trails can be difficult to comprehend in the beginning but provide a plethora of options that allow visitors to set up exactly the kind of hike that they desire. The main trail down the hill to the river trail is pretty steep. The overlook point is beautiful. 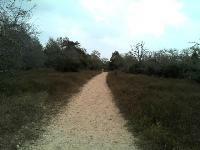 There is a wide range of trails to choose from at McKinney Roughs, which is possibly its best feature--your hike can be as long or as short as you want. I took the Pine Ridge to Cypress and returned by Riverside, which means I saw piney woods, open grasslands (loads of little bluestem), and riparian ecosystems. Much of the trails were flattish, but there were zones of intensity going down to the river and back up to the ridge. I saw 2 other small groups on the entire hike, and no horses. The negatives are the inexplicable lack of signage at key junctures (despite copious signage overall), and the fact that the map and reality weren't entirely in sync. I ended up going the wrong way a couple of times because other paths intersect with Pine Ridge and aren't marked on the map, nor are they signed. Plus I took a very big extra loop around the trail because I missed the poorly marked turn-off at the overlook (you go over the crest of the hill, down what looks like at first like a drainage channel). Also, the map shows the overlook as occurring between markers 10 & 11, when it's actually between 9 & 10. Similarly, the Valley View Trail intersects with the Riverside Trail between markers 2 & 3; not between 1 & 2, as shown on the map. I guess this all sounds a bit titchy, but it was cold, and it was a long hike, and going repeatedly astray made me a bit grumpy. On a happier note, I saw a couple of ladder-back woodpeckers and (what I think was) a dark-eyed junco, plus a deer. Birdwatchers should bring binoculars and chill out at the picnic table on the Cypress Trail to enjoy some ornithological action. Stayed at the Hyatt Lost Pines last weekend, so started from the hotel trailhead, then Pecan Bottom to Buckeye to Yaupon to visitor center. Then continued on Riverside to Fox Tail to Pine Ridge to Cypress to Riverside to Coyote Road to Deep Sandy and back to the hotel. Elapsed time was 3:31 hrs. Not too many people along the way; most of them rode their horses. Yaupon was completley empty. Overall a nice hike. Visitor center guy was helpful with general info. Note that the main gate is closed on Sundays, so use either the hotel trailhead or Pope Bend or Hwy. 71 trailheads. If you can stand the heat, it's still a great hike. I've previously done the northern trails so my party and I decided to do the lower section. 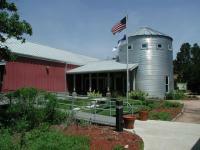 As others have mentioned, the Visitor's Center and main gate are closed on Sundays, so you have to enter through the 71 Trailhead. We started on Whitetail and double-backed on Pine Ridge at the pond spur. This area of Pine Ridge is very exposed, so bring plenty of water. 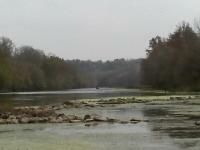 Continuing, we went Cypress to Riverside and back to Whitetail. For whatever the reason the main gate was closed, Sunday at 1 pm, but they said you could enter where the horses do (2 driveways east). In 3 hours we only saw one group, 6 people on horses. Really nice trail but don't bother with Yaupon on the west end, long, boring, and steep. Very hot day for us but we do love this park. Pine Ridge to Riverside and back on Woodland is a great way to go. The overlook isn't much. This was our 3rd hike here in just over 3 years. Hiked Riverside, Bluestem, Cypress, part of Pine Ridge, Bobcat Ridge, Foxtail, part of Ridge, Woodland, part of Bluff Trail Loop, part of Coyote Road, and a portion of Youpon trails. 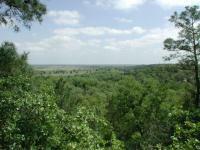 I hiked McKinney Roughs Nature Park with a group over a 2 day weekend. This log covers the first day. 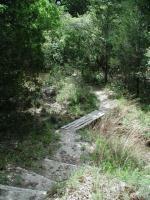 The 2nd day log of the other trails in McKinney Roughs can be found here. We started near the Visitor's Center and hiked various trails around the Nature Park and along the Colorado River. The trails are very well-marked and maintained. Some are for hiking only and others double as equestrian trails, so expect a lot of horse poop. Mountain bikes are not allowed, however, which is kind of nice as it reduces the overall traffic and collision potential. 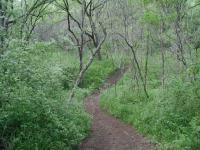 The trails were flanked by very lush, green vegetation, including some nice specimens of cactus. I spotted two cottonmouth snakes sunning on a rock and was impressed by a couple of HUGE pecan trees. The trail surface is rocky in several spots, so its a good idea to wear good boots to avoid blisters and twisted ankles.